Found this barn late last summer. I knew it was there, but this view had been hidden by dense foliage and underbrush. The park cleared away a lot of the growth and left this opportunity. I did a small, 8″ x 16″, plein air study of this farm, but decided to do this painting as a demonstration for my Oil / Acrylic students. Many of the class demos get wiped away (destroyed) once I get back to the studio, This one was worth keeping. Came across a watercolor sketch created a few years ago. Had some time available and decided to render the design in a small oil painting. Interesting day. Plein air painting in the morning. Studio painting in the afternoon. I was planning to cut the lawn after dinner when my youngest son surprised me (in a good way). My son had been working on an upcoming sermon all day and decided that by cutting the lawn, he could get some fresh air and exercise. While he was cutting the lawn, I took advantage of the beautiful clouds in the sky. I grabbed my paint box and bucket of supplies and set up on our front porch. I finished the first painting as my son was finishing the lawn. I felt that there was still enough daylight left to attempt another small painting, I moved out onto the front lawn, looked south and set off to work. I worked to the mid-tones and then brought up the highlights towards the end of the painting. Primarily used, Ultramarine Blue, Cadmium Yellow, Alizaron Crimson and Titanium White. A couple of fun studies. We experienced a couple days of partly cloudy days. Great inspiration. I took some time to get sketches and some color studies. Tough to capture a moving target. As I sketched, I thought about incorporating some of these designs into a landscape. Problem was that the land in front of me was far less than inspirational. I remembered that I had some sketches created at the Rock River which had less than spectacular skies. Okay, they were boring skies. I ventured back into the studio with my cloud sketches, dug out the river studies and married these elements together. 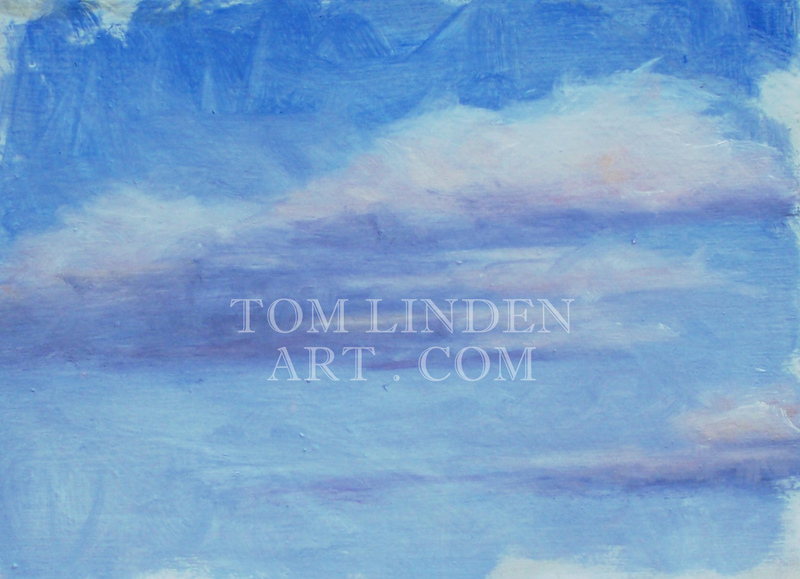 Background sky is a mixture of Titanium White with Ultramarine Blue and Cerulean Blue. The clouds have combinations of Ultramarine Blue, Alizaron Crimson and Cadmium Yellow. 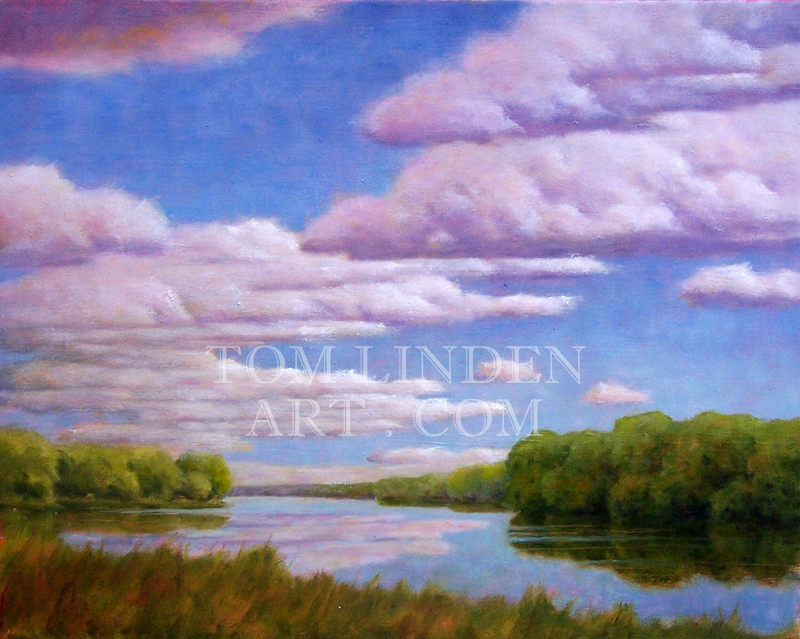 June Morn at Chapel Road, Oil on Canvas 12" x 24"
I created this painting in my studio, using sketches created in between rains during the Fields Project. 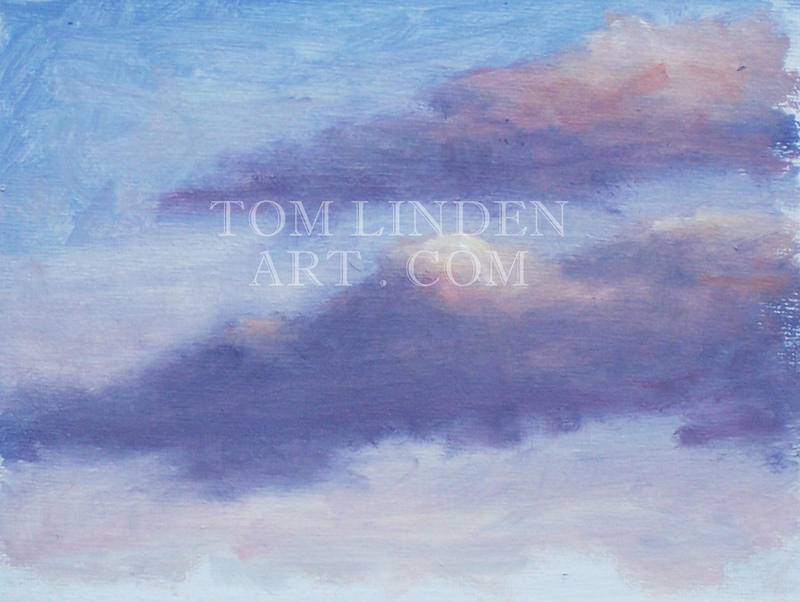 After doing an initial oil sketch on my canvas, I put a light wash of Alizarin Crimson in the sky. I love the way that the essence of the crimson comes through the body paint used in the sky. Works well with the greens of the foliage.